Last week, Amgen announced their third quarter earnings which included a $780 million charge related to a legal settlement they entered into with the federal government and a number of states concerning “illegal sales and marketing practices”. Now $780 million dollars is a large amount of money by anyone’s measure, but if you read the third quarter report, it sounds like there were some “questionable” actions on the part of Amgen, but it’s all worked out now and we can get on with business, right? If you read the Massachusetts whiteblower lawsuit court documents, it appears that Amgen committed some very serious crimes which weren’t the action of just one or two employees, but rather an intentional marketing tactic that involved a large number of Amgen employees all the way up to senior management. And if you live in the US and pay taxes, you should be very, very mad. The product in question is Amgen’s Aranesp, a erythropoetin analogue, which stimulates the production of red blood cells in the body. It is used in patients undergoing chemotherapy (since many anti-cancer drugs damage bone marrow, where red blood cells are made) and patients with chronic kidney disease (since erythropoetin is made in the kidneys) to boost their levels of red blood cells. It’s a very profitable drug for Amgen, with total sales just north of $2.5 billion dollars in 2010. 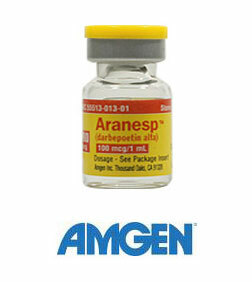 Now this is where things get a little complicated… Aranesp is a longer-acting version of another Amgen product, Epogen, the first erythropoetin analog that was originally used for dialysis patients. When Epogen was developed, Amgen outlicensed the rights to Epogen, outside of use in dialysis, to J&J, which sells it’s version as Procrit. So as you can imagine Amgen’s current strategy: get patients who use Epogen or Procrit to use Aranesp, since why would you want to share the market with J&J? Now that we have the background laid out, we can get down to the details of the case. Aranesp is sold in either vials (as pictured above) or as prefilled-syringes. Since it’s impossible to to get all of the liquid out of a vial, or inject all of the liquid in a syringe, manufacturers of injectable drugs often “overfill” their products, or basically add a little bit more of the drug to the vial or syringe, so that when a physician or patient administers the drug, they get the full dose. How much do they need to overfill? Less than 10% typically. Well, someone at Amgen had a smart idea that they could overfill the vials or syringes of Aranesp by more than 10%, then “hint, hint, nudge, nudge”, let doctors know that they are actually getting more drug than what they paid for. Why would they do that you ask? Well, doctors can bill insurance companies and Medicare for each dose of Aranesp they give patients (they actually bill in 5ug increments). 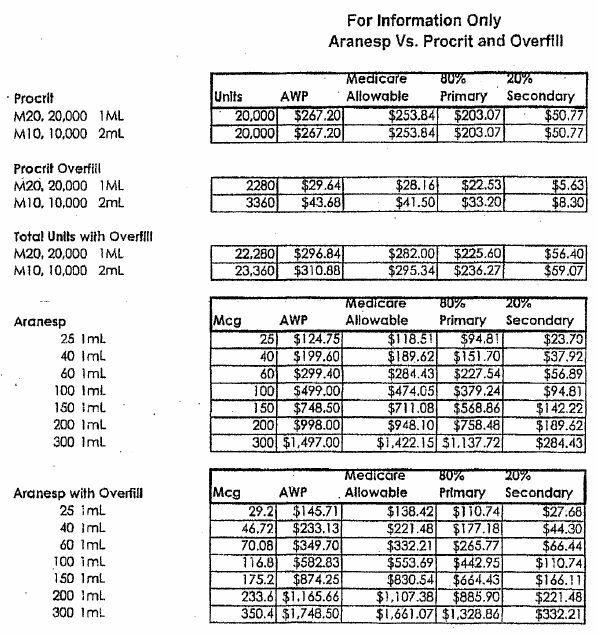 So if a doctor orders 5 vials of Aranesp (each one overfilled by 20%), they can actually bill for the 6 doses of Aranesp they actually gives patients (basically pooling the extra 20% until it adds up to a full dose). Amgen was giving physicans a kick-back for using Aranesp, paid for by YOU, the taxpayer (in the case of Medicare/Medicaid patients). Now you might be thinking this was a scheme devised by a few rogue Amgen employees, working on their own accord. Well, you’d be wrong. Nevermind the fact that sales reps don’t have any control over how much “overfill” is included in each vial or syringe of Aranesp (that’s a decision made by manufacturing), there is also the fact that information on how much the vials were overfilled and how much extra money physicans could make charging insurance companies for the overfill amount was sent out by Amgen’s medical affairs department (document below is from this link). 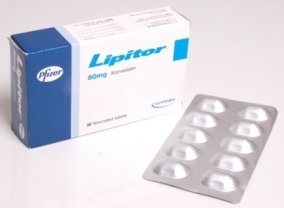 Yup, you read that right, the older erythropoetin analog that Amgen wanted patients to stop using? They started to reduce the overfills in that product to ensure that doctors were only getting a kick-back for Aranesp. I’m literally at a loss for words. The pharmaceutical industry has taken a lot of heat (rightly so) for their off-label marketing of drugs and other nefarious activities, but this takes the cake. This is not some sales rep promoting a drug for an unapproved condition (in that case, at least the patient is getting what they paid for), this is a deliberate, organized scheme to defraud both private insurance companies, Medicare/Medicaid and in the end, you, the American taxpayer. Honestly, I think anyone associated with this scheme, from the CEO down to the account managers needs to be fired and the whole organization rebuilt, from the ground up. I mean, how else do you rid a company of the mentality that thinks this is OK?